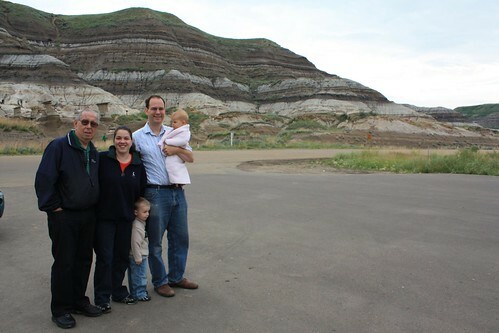 We continue to tour Grandma and Grandpa around Alberta. 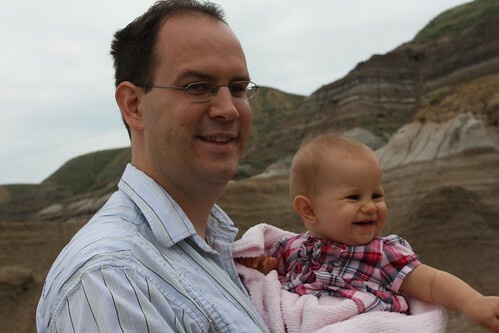 Today, we took them to see the hoodoos. Connie was a lot more into the experience this time. My parents really enjoyed the experience. It is definitely different than anything in Mississauga! 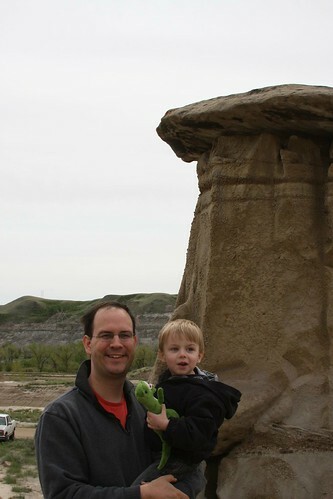 From the hoodoos, we went into Drumheller. 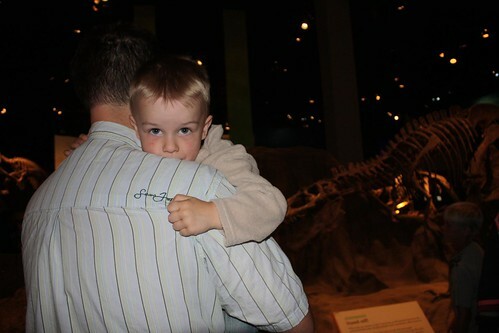 The last time we came out as a family, we wanted to go to the museum there but we ran out of time. Fortunately, this time, we made the time. We expected that Dougie would love it. 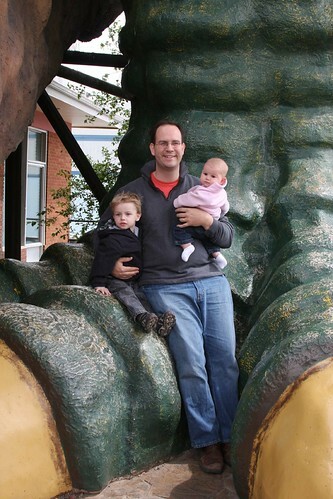 They have lots of dinosaurs and we thought he would be thrilled. We were wrong. Very very wrong. Overall, it was a fun day trip but it will be a while before we go back to the museum. Now that it’s getting warmer and people are starting to come out of their houses, we decided that we need to start experiencing more of Alberta. Who knows how long we’ll end up being here and there is so much to see! 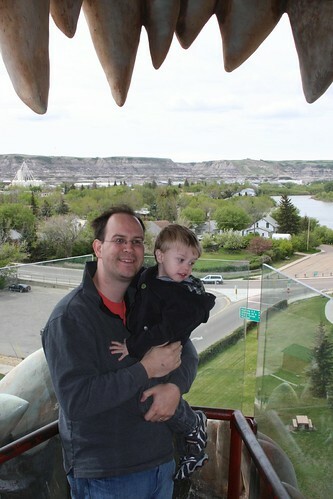 So, we decided to make a day trip out to Drumheller – it’s about an hour and a half drive from Calgary. 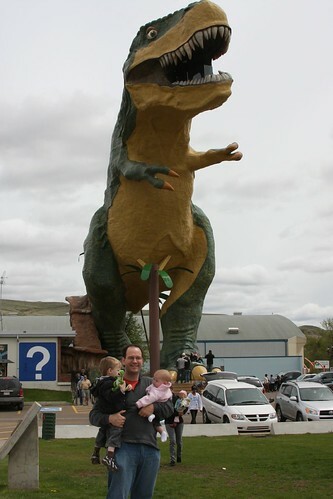 For those not familiar with Drumheller, it’s most famous for its dinosaurs. We thought Dougie may enjoy it since he sort of likes dinosaurs. 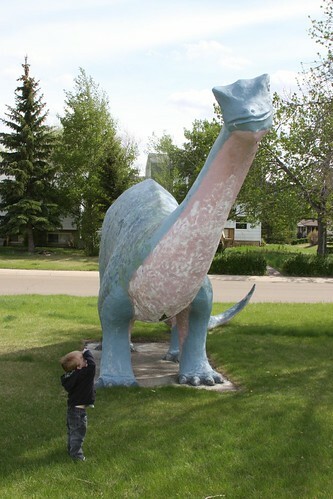 Well, I should more accurately say he used to “sort of like” dinosaurs, now, they are his favourite thing on earth! 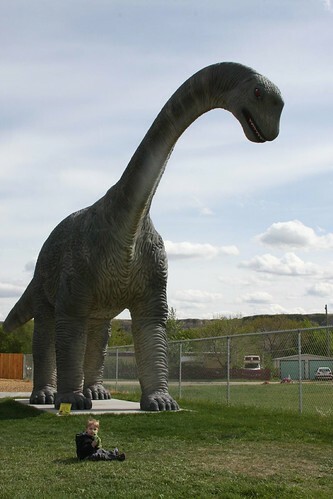 For $3, you could climb up into the mouth of the dinosaur. Of course, we had to do that. 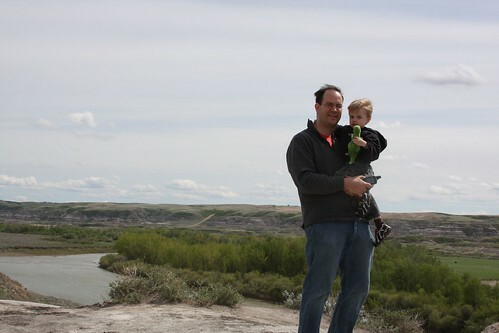 Dougie at this point was so enthralled with everything dinosaurs that it was hard to get him to look anywhere else. They just have these things on every street corner. 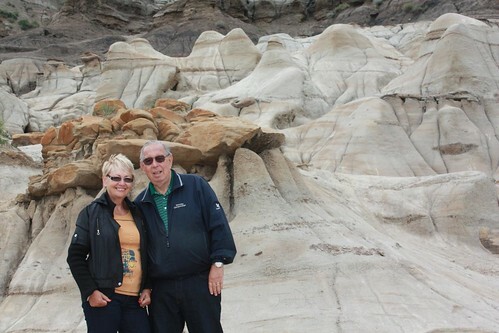 There is more to Drumheller than dinosaurs, it also has some of the most impressive Hoodoos in the world. Of course, we had to stop there. 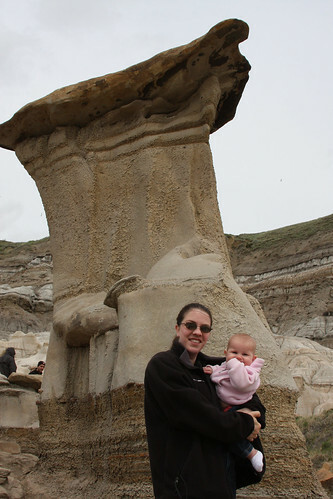 Mum and Connie in front of one of the hoodoos. Notice we didn’t totally escape the dinosaurs. From the hoodoos, we went to an old suspension bridge that took us over to an old mining area. The bridge isn’t used for that anymore but it’s maintained by the province for tourist use. I was not a fan. We climbed a reasonably large hill there to get a better view of the area. We didn’t see the mine but it was a lovely little excursion. After a long day, we were all very ready to get home. We didn’t hit all the sites we were hoping to so we’ll have to go back. 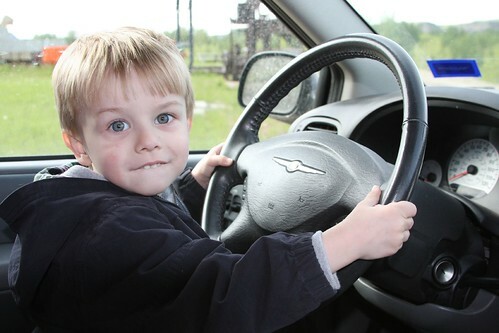 We decided to let Dougie drive home, he has to learn sometime.